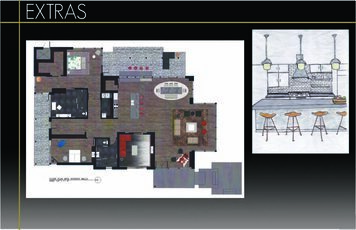 Interior design sample by Ashlee B.
Ashlee has a BFA in Interior Design. 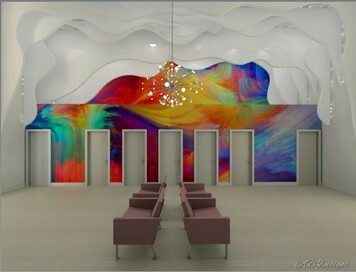 She has worked as a designer for architects, interior designers and furniture designers in Tampa, Florida. Ashlee believes that interior design is more than decorating - it is problem solving. When a room is properly laid out to meet a standard of form and function; her work is complete. Ashlee is experienced in both residential and commercial design. Her designs are BOLD. ORGANIZED. INNOVATIVE. I love mixing a little bit of old with new - it is exciting to use older pieces to give an eclectic style to a space - yet still maintain it's original form and function. Certain furniture pieces scream great design even if they are from an older generation. I like to use the words vintage rather than ancient! It's nice to keep those memories in a space while adding a touch of new for a fresh look. Interior Design is more than decorating, it is problem solving. To understand the basics, grasp every detail, and visualize a space for form, function, and comfort is the reason why I enjoy designing interiors. When I walk into a building, room, or space I catch myself looking at every detail, not just entering the room, but seeing everything that it is and then visualizing what it could be. Whether it be moving furniture around to create a better form, organizing an area; adding accessories, finishes or lighting; Paying attention to detail is a must and can change an entire design style or concept of a room. This then can enlighten and alter the overall mood of a space. The logistics come alive and ignite the ideas in my brain as I enter a space and it seems as though the flame never burns out. The constant thought process on how to make a space better is the reason I love what I do. Design style is constantly changing. It is very important to stay updated with the current trends. It is also important to be inspired. My inspiration comes from certain objects; for example: artwork, furniture or accessories.